The hotel Cordelia is the place where romantic writers used to meet in the 19th century. In an elegant and relaxing atmosphere of serenity, Countess Cordélia of Greffulhe invites you to discover her 30 non-smoking and air conditioned rooms, all recently renovated. A harmony of shimmering colors combined with some historical eye winks, a modern equipment and the courtesy of our staff will make your stay a special moment! The rooms are differently decorated but they stay true to style, each of the 30 rooms (Classic, Comfort and Premium) have contemporary requirement and charm that inspire relaxation and serenity. Some rooms will surprise you with a flowered window. The hotel CORDELIA’S rooms inspire heaven and are placed in the heart of the world’s business and fashion. They offer guests the assurance of a stay under the sign of comfort. Classic room: A single room of 10 m², high quality bedding, 160 size bed, private bathroom with a shower. The classic room combines comfort and modern equipment, ideal for a short stay. Comfort double room: These rooms of 14 m² are equipped with a 160 or a 180 sized bed, a private bathroom with shower or bath. Comfort twin room: Twin room of 14 m², equipped with 2 single beds of 90 cm, a private bathroom with shower or bath. The comfort rooms offer a lot of space, they are quiet and are nicely decorated; they are perfect for both getaways and business travelers. Premium room: The premium rooms are located on the upper floors; the balconies give out on an enjoying Parisian view. These rooms are equipped with a 160 or 180 sized bed, or two 90 cm beds, 14 m², private bathroom with shower or bath. VIP welcome, bathrobes, slippers and additional home products. The Hotel s unique charm is to offer its guests a warm setting and atmosphere to make them feel just like home. Countess Cordelia invites you to settle down near the alight fireplace, to pick a book from her bookshelves or to converse in her hushed drawing rooms. After a busy day, our room service offers a wide choice of cold meal trays. Ideal if you wish to eat on site. - Free Wireless internet connection in the whole hotel. - The nearby public parking is charged 20 EUR / 24h. 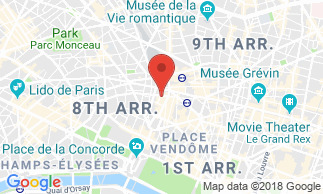 The hotel is situated between Opera and the Madeleine, a few steps fro the big Department Stores and less than 5 walking minutes from the most fashionables street 'rue du Faubourg Saint-Honoré', from the Boulevard Haussmann and the Saint-Lazare railway station. Buffet breakfast not included : 16 EUR per person. In the early hours, a sumptuous breakfast will be served to you, made of hot Viennese pastries and crispy bread rolls, concocted by our good offices, in an aged vaulted cellar with arched ceiling and beautiful stone walls. Hotel Cordelia Charmingly marvellous !!! Hotel Cordelia Very good welcome, good situation. Nothing to add.